Soldering, or 'soft' soldering, is a process in which two or more parts are joined by melting and flowing filler metal into the joint with the filler metal having a relatively low melting point. The melting point of the filler metal is below approx 420°C (~780°F), and bonds to the materials by wetting action. The resulting joints are not as strong as the base metal, but have adequate strength, electrical conductivity, and water-tightness. Silver soldering, also known as 'hard' soldering or silver brazing, is a process in which two or more parts are joined by melting and flowing filler metal into the joint. The melting point of the filler metal is above 420°C and flows into the joint by capillary action. A silver soldered joint is a sandwich of different layers, each metallurgically linked to the surface of the joined parts, and is very strong - much stronger than soft soldering. It is called 'silver' soldering because the filler material often contains silver. Welding is a process in which the base metal is melted during the joining process, the two halves of the molten joint flow together and allowed to freeze. Although soft soldering and silver soldering both introduce a filler material (solder) into the joint, in soft soldering the solder just adheres to the surface. In hard soldering, the metallurgy of the surface is changed and the joints are metallurgically linked, and becomes part of the underlying metal surface. This is why a silver soldered joint is very much stronger than a soft soldered one, and sometimes stronger than the base materials joined. Soft soldering and welding are not further considered here. Silver soldering is NOT a gap filling process, and requires a gap of only a few microns (0.001mm) or 1 or 2 thou (0.001") for proper capillary action during joining of parts. It does however require a small gap for the solder to flow into the joint. This often requires the items to be machined to close tolerances. The best joint design is one where there is an overlap of the components in the form of a lap or sleeve join. Silver solder will join almost any metal (brass, bronze, copper, steel, cast iron etc, except aluminium). Clean parts are absolutely essential, and next to godliness. There should be no sign of oil or grease, and should preferably be scrubbed mechanically with fine emery cloth, synthetic pot scourer or similar. Use a degreaser if required. Any oxides on the surface can be removed by pickling in citric acid (lemon juice) or acetic acid (white vinegar) for several hours. Citric acid is available in powder form from a chemist. Flux is a material that cleans the surface of the metals by removing oxides from the metals to be joined, and prevent further oxidisation, during the heating process. Flux is an essential part of silver soldering, and usually applied as a thick paste. Too much flux will rarely cause any problems, but too little can ruin the work, as it prevents the capillary action of the solder into the joint, or fails to remove the oxides properly when heated. Heating of the job should be done reasonably quickly to prevent exhausting the flux. A propane torch is all that is required, and provides gentler broader heating as compared to an oxy acetylene flame which can be too hot and concentrated, and should be avoided unless you are skilled in it's use. Just choose a burner of sufficient capacity for the size job in hand. Heating should be even for the whole job, and ALL parts of the assembly should be at or about the same temperature. Allow the joined parts to cool naturally to room temperature. Just remember that some base materials may change their properties after being heated to the red heat required for silver soldering. After soldering, you should clean any accumulated flux from the job, and clean by pickling or emery paper. Check from both sides where possible that all joints are soldered correctly, if not it is usually possible to re flux the work and repeat the soldering process after cleaning. Make sure the solder has fully penetrated the joint, and there is a small fillet of solder in the corners. It is important that the job is heated evenly to ensure that the metals will be at the right temperature for the solder to flow easily. If thicker and thinner parts are to be joined, heat the thicker parts first, even to the extent of heating only the thicker parts from the back until they are at temperature, then heating only briefly the thinner bits - they will be hot already from being (indirectly) in the flame. See diagram below. A bead of silver solder, held in place by the flux, will melt through the joint when the thicker base is at the correct soldering temperature. Another way to get even heating (and often with less heat loss) is to use a hearth made from insulating firebricks. See figures below. Small amounts of silver solder can be placed along the joint by cutting a small piece to fit the join length. It is put into place BEFORE heating and lies there held by the surface tension of the flux until it melts. Note that silver solder always flows towards the heat source. If the assembly is likely to move during the soldering process, wire the parts together with copper wire to hold them in place. Useful also when a second soldering operation is necessary on the same assembly. Just remove and discard after soldering. If the part is more complicated, then some thought needs to be given to the sequence of build. The flux must melt and be active by the time the silver solder melts. Fluxes like most things have a finite life and can become exhausted, depending on how hot and for how long they are heated. Apply flux with small brush or steel wire, or the by the solder rod itself may by dipping the hot end into the dry flux powder and then transferring it to the work. After the part cools down it then goes into a pickle bath for around thirty minutes before being washed off in running water. Don't get the assembly too hot - brass fittings tend to melt instantly if too hot! 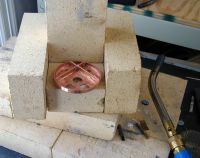 This is one reason to indirectly heat the joint from the other side, and the solder only melts when everything is at the right temperature (rather than melting first in the flame), and goes into the joint. Remember, even gentle heating is better than concentrated heat. As a guide to temperature, the state of the flux or the colour of the metal may be used. The colour of the metal also provides a guide to its temperature, and a little practice on scrap pieces is advisable for beginners. When heating, it is better to continually move the flame about over the job than to just keep it fixed in one place. And concentrate on heating the whole job, not just one part. Quenching from the hot state is unnecessary and can be dangerous as steam generates in hollow parts of the work and can be ejected at high velocity, if acid is being used things are worse as fumes are often given off as well. Quenching also produces thermal shock causing uneven stresses and may ultimately damage to the work. Better to let the part cool naturally to room temperature. After pickling rinse copiously with clean cold running water, small areas of flux remaining are easily removed with a synthetic pot scourer or a piece of sharpened wood to get into comers. Pickling is best done in plastic containers. A soldering hearth can be made from insulating building blocks, these are available at reasonable cost from building supply merchants under the trade names Celcon or Thermalite. See figures above. They do not spoil or shatter under heating and may be easily cut or carved to hold parts whilst soldering and are usually much cheaper than fire bricks. Do not use bricks from old storage radiators as these are designed to absorb heat and you can waste a lot of time heating them up instead of the job. Insulating blocks quickly heat up on the surface and glow red thus adding to the heat input into the work. Standing spare blocks around the work will improve the heating time. Also allow space to park the gas torch until it cools down. Do not use ordinary house bricks either. One reason is that they tend to absorb moistrure, and when heated, the absorbed water boils to produce steam which can cause the bricks to crack or even explode! Also, they absorb an enormous amount of heat and there is no point in wasting heat (and $) just heating them up. Silver soldering produces fumes, and you should avoid breathing these. A mask is a good idea. Solder only in a ventilated area (but not so ventilated that breeze cools the job!). Stand back from the work not over it. Goggles and gloves are essential. These parts get hot! Don't be tempted to touch anything even with gloves on unless you are sure it really is cold, always lay down sticks of solder with the hot end away from you. Be careful of stray naked flame. It is very easy to concentrate on the job in hand in front of you and wave the flame elsewhere, and possible set the workshop alight. Be careful with any of the chemicals involved, and thoughtful disposal of the pickle solution is recommended. The heat from soldering a large item (such as a boiler) can be overpowering and exhausting, so be aware and be careful. Dehydration and heat stress can and do occur. Some people wear a so-called survival blanket as an apron when working, or even a sheet of aluminium foil, to reflect the heat. The propane torch should be complete, with a burst hose protector/flash back arrestor for connecting to the gas bottle. 273 Text and photos Copyright © 2006-2019 SMEX, All rights reserved.